About 60 percent of jobs in the U.S. require some postsecondary education. Yet in 2015, there were about 111 million adults who didn't have college degrees. Most of them wanted to earn college credentials but saw cost as their greatest obstacle, according to a survey conducted by The Learning House, Inc. and Aslanian Market Research. Fortunately, thanks to changes made to federal law in 2006, online students at accredited institutions may be eligible to receive federal aid, just as any traditional on-campus student would be. In this guide, you'll discover what financial aid options exist for eligible online college students, in a variety of life situations, and how to go about receiving those needed funds for your education. Citizenship: You must be a U.S. citizen or U.S. national. If you don't have either status, you must possess a green card, an arrival-departure record from U.S. Citizenship and Immigration Services, "battered immigrant" status under the Violence Against Women Act or a T-visa or T-1 visa. Educational qualification: You must qualify to receive a college or career school education by having earned a high school diploma (or the homeschool equivalent) or General Educational Development (GED) certificate. Enrollment: You have to be enrolled or accepted for enrollment at an eligible (read: accredited) degree or certificate program. Selective Service registration: Males ages 18 to 25 must be registered for Selective Service. Social Security number: You must possess a valid Social Security number (except students from the Republic of Marshall Islands, Federated States of Micronesia or the Republic of Palau). Signed FAFSA: You must complete the Free Application for Federal Student Aid, or FAFSA, which includes a signature certifying that you are not in default on a federal student loan, do not owe a refund on a federal grant and will use the federal student aid only for educational reasons. Academic performance: Maintain your eligibility by earning satisfactory grades in your postsecondary programs. It's possible to lose eligibility for financial aid once it's received through poor academic performance. Additionally, individual state and institutional financial aid awards, as well as privately administered grants and scholarships, may have their own eligibility requirements, such as a certain income threshold, a particular course of study, a particular grade point average (GPA), participation or membership in certain organizations or groups, belonging to a certain demographic or population and other criteria. It's important to read about any financial aid program's eligibility requirements before applying. Discover below the different types of financial aid you may qualify for and how these can help you receive funds for your education. Each year, the federal government makes available more than $120 billion in financial aid, through grants, loans and work-study programs, which students may only access by completing their FAFSA forms. In academic year 2015-16, an impressive 85 percent of first-time, full-time undergraduate students at four-year colleges, and 75 percent of students at two-year institutions received some federal aid. About $30 billion of the federal budget for student aid goes toward need-based grants, which are financial awards that need not be paid back. Loans must be paid back; in 2017, the government financed about $100 billion in student loans. In work-study programs, students earn aid by working. Work-study programs allow students to work up to 20 hours a week on campus or in organizations in the community. The job may be related to your major or community service. Most states in the U.S. offer some form of student aid. Usually, it's provided to students residing in those states — but not always. Often, state financial aid programs are developed with an eye toward boosting the state's college-going rate or generating more interest among students for high-demand careers or positions experiencing statewide worker shortages. For example, in Hawaii, students attending one of the 10 institutions that are part of the University of Hawaii Community Colleges system may be eligible for free in-state tuition, as part of Hawaii Promise, an effort to improve the state's college attainment. The usual first step in qualifying for these awards is the same as that for federal aid: completing the FAFSA. The federal government then forwards that important information to individual states' financial aid departments. Some states have their own application forms as well. The National Association of Student Financial Aid Administrators (NASFAA) tracks individual states' available financial aid programs. Explore our individual state pages on OnlineDegrees.com to discover what financial aid programs may be available in your desired location. The individual online college you're considering may have its own financial aid programs available, which may be contingent upon financial need, merit, path of study or some other specific criteria. They usually come in the form of grants or scholarships, which don't need to be paid back, and they may be awarded to students as incentives to draw students to attend those schools. Again, in the case of school-specific financial aid, the FAFSA is used by individual colleges to determine need and how they may be able to assist students in affording enrollment. Individual schools may also have their own financial aid applications that students must complete in order to access financial aid, so it's important to discuss your needs with any prospective school to learn what its individual requirements are. Grants are often called gift money, as those funds don't have to be paid back. 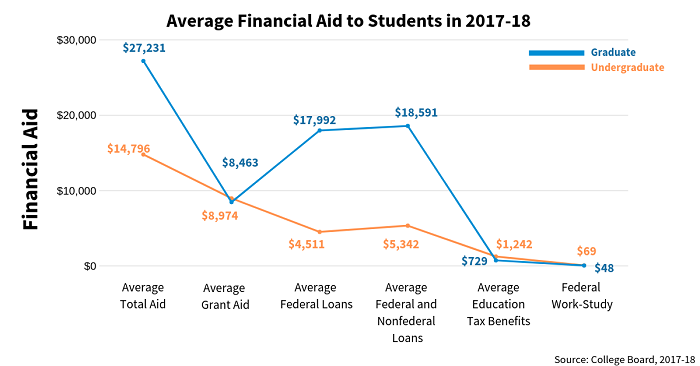 Government grants are typically awarded based on students' demonstration of "exceptional financial need," although institutions may have different qualifications, which may not factor in need at all. Need — and total award amount — are usually determined by a complex calculation that takes into account factors like your expected family contribution; the cost of attendance, which includes tuition, books, technology, child or dependent care and other educational expenses; and any sources of funding you may already have (such as private scholarships). Some grants include stipulations, such as a requirement for performing some type of service. In 2014-15, 33 percent of online students relied on government grants to pay for their educations. Federal Pell Grant: The Pell Grant is an annual award given to undergraduate students who show exceptional financial need and have not earned their bachelor's or professional degrees. Though the maximum individual award can change annually, in 2018-19, the maximum Pell Grant award per student was $6,095. Federal Supplemental Educational Opportunity Grant (FSEOG): The maximum annual FSEOG award given is $4,000, and it is available to undergraduates who demonstrate exceptional financial need. Teacher Education Assistance for College and Higher Education (TEACH) Grant: This grant for up to $4,000 per year is for undergraduate, postbaccalaureate and graduate students pursuing teaching careers who agree to participate in four years of qualifying teaching service. Iraq and Afghanistan Service Grant: This grant is designed for students whose parents or guardians have died in military service in post-9/11 Iraq or Afghanistan but who did not meet the "exceptional need" requirement of the Pell Grant. Check your individual state or prospective institution for other potential grant opportunities. Thirty-four percent of online students received scholarships as part of their enrollments in 2014-15. And The Student Loan Report conducted a survey of 1,000 college students (online and on-campus) that found that of the 84.5 percent who did apply for scholarships, 55.86 percent of them won at least one of the scholarships they applied for. And yet of the more than $3 billion available to students through private scholarships each year, many awards go unclaimed simply because students don't know they exist. Apply to everything. The worst a scholarship provider can say is no. Many reputable sources, such as The College Board, FinAid.org or Schools.com, allow you to search scholarships by field of study, along with other criteria such as gender, disability, ethnic or cultural background and more. The major or degree you choose to study may even help you to qualify for financial aid. Each year, scholarships are offered to students who opt to study a wide range of subject areas, from accounting to zoology and everything in between. Often, these are created to drive interest in high-need fields, such as those in STEM subjects or nursing. This scholarship is typically for student artists in film, design, music, dance, photography, visual arts, theater and writing. It may award up to $10,000 for those who qualify. Prospective students also become eligible to participate in National YoungArts week typically in Miami, New York, or Los Angeles. This scholarship is designed to recognize students who demonstrate a similar passion for public service and who demonstrate academic potential, leadership, and financial need. Candidates are required to demonstrate desire and a plan to pursue a career in police work, corrections or other criminal justice fields. The scholarship is typically available to any Vermont resident who may be studying for a degree in a healthcare profession and who plans to work in home care in Vermont upon completion of the program. The awards typically range from $1,000 to $3,000. To apply, the student must contact the Vermont Student Assistant Corporation (VSAC) for an application. There are organizations that typically offer cybersecurity scholarships to students pursuing a career in this important and in demand field, so if you are looking to land additional funding for college, be sure to check out these cybersecurity scholarships. You may be awarded up to $5000. Designed specifically for accounting or finance students, this scholarship may award up to $8000. It is typically available for two graduate or undergraduate full-time students who are preparing for careers in state or local government finance. Candidates for this scholarship should have a superior record of academic achievement. Additionally, many of these scholarships are offered to particular types of students studying these fields, such as women, African Americans, those affected by certain disabilities or illnesses or other such demographics. It may interest you to note that The Student Loan Report study saw no marked difference in scholarship "win" rates among the various demographics surveyed. Any number of scholarships may be available to students based on age, gender, race, socioeconomic class, profession, religious or cultural background, or family history. Students who complete the optional questions are twice as likely to be matched by potential online scholarship matching services. These questions are designed to trigger certain types of scholarships in these searches, so answering them may widen your pool of options. These days, there are scholarships for nearly every passion imaginable, from writing to building robots, duck calling or quilting. Once you've got a list, start your online search — you might be amazed at what's available. Many local groups, from clubs to professional or charitable organizations or even religious groups and churches, tend to provide students with scholarships for college. Check with them. These professionals are tasked with maintaining lists of scholarships that their students may qualify for. They may know of local opportunities that aren't readily known by students and their families. If you're currently employed and considering returning to school to advance your career, your employer may help you foot the bill. The IRS allows employers to provide up to $5,250 in tuition assistance per employee each year, and that amount is not taxable. These funds may be used for educational expenses, including courses, books, supplies or equipment that students need to purchase as part of their schooling. Additionally your employer may offer scholarships or even cover the cost of professional exams for licensure. Consult directly with your employer's human resources department to learn what options you may have. The FAFSA form is typically long — 100-plus questions — so be prepared to spend a bit of time to accurately complete it. You may be asked to provide personal data, personal income for your parents or household, tax information from the previous year and details about your intended school. It's best for high school students to fill this out in fall of their senior year of high school. Adult students should plan to do so in the fall prior to the year they plan to attend school. Most high schools and college financial aid departments typically employ counselors or advisers who can assist students with this process. This detailed online form typically gives students access to information about more than 400 nonfederal, institutional and organizational grants totaling more than $9 billion. It is also generally available from October 1. Plan to complete it in a timely fashion in order to improve your chances of receiving awards. It has an online application access virtually 24 hours a day, 7 days a week. The form typically asks questions about student's financial status as well as student's parents. The information you give is then sent to colleges or universities that the student specifies. Signing this form certifies that the information contained in your FAFSA is correct, and that the IRS and U.S. secretary of education have your permission to verify the information you've provided. You may be required to complete this form only after you have submitted the CSS Profile. Parent signature may not be required in case of independent student. If the students are required to provide parent financial information on their profile, the signature of at least one of the parents is generally required. You may also be asked to complete state- or institution-specific financial aid applications, as well as forms pertaining to your tax-filing status. Speak directly with your desired school's financial aid office to ensure you are completing all necessary forms. When Can You Expect to Hear About Financial Aid Awards? Typically, students receive their financial aid offer letters around the same time as when they receive offers of admission, though this may not always be the case. Your college can usually tell you when you can expect to receive your award letter. How Much Financial Aid Can be Awarded for Online Students? To give online students an idea of the amount of financial aid that can be awarded for those who qualify, here is a graphical representation of average financial aid given in year 2017-18. According to the College Board, in school year 2017-18, undergraduate students received an average of $14,790 in aid, including grants from all sources, federal loans and a combination of tax credits and deductions. Graduate students received the total of $27,231. Here is how those dollars broke down by type of aid awarded. Take advantage of free resources. Your high school counselor, college financial aid specialists and state and federal department of education representatives are all keenly focused on getting (and helping!) more students to complete their FAFSAs, receive financial aid and complete their college degree programs. If you're struggling, ask for help. Don't let a confusing form stand between you potential college funding. Don't assume your income or age disqualifies you for financial aid. In fact, a Sallie Mae survey found that 16 percent of high-income families received an average $6,580 in grants in 2014. And for many scholarships, income isn't a factor in determining who receives money. In fact, returning adults who want to attend online college may actually qualify for specific scholarships intended for that demographic. Don't pay anyone for college financial aid. The FAFSA is entirely free to complete, as is the CSS Profile. Any legitimate source of financial aid should not have an application cost; don't give money to anyone claiming to offer scholarship or grant dollars for a fee. And on that note, no one should need to run a credit check on you. You can't receive financial aid from federal, state or local entities if you don't attend a regionally accredited program, so before you consider attending any online college, check its accreditation status with the U.S. Department of Education.